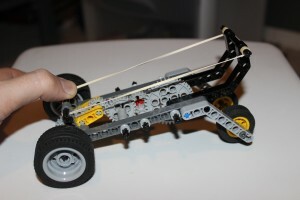 Inspired by Isogawa Yoshihito, I decided to try to make a rubber-band powered LEGO car that could be wound up using a lever. 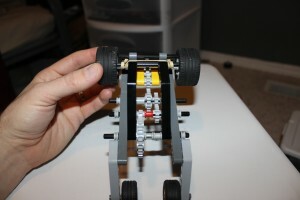 His method of creating a wind-up LEGO machine is quite ingenious. I’m not sure if ISOGAWAY came up with it, but I assume he did. I will try to describe how this LEGO machine works, but the video below might be more helpful. 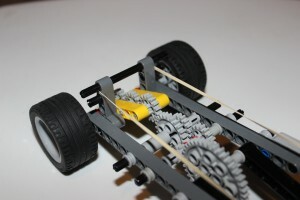 The car has a lever which is attached to a large gear. This gear is part of a set of gears are placed so that turning the large gear turns other gears several times (using the gear ratios). 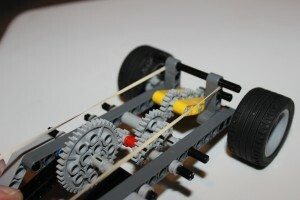 One axle on the car turns freely, but another is attached to a set of three gears (this could be as few as two or as many as several). 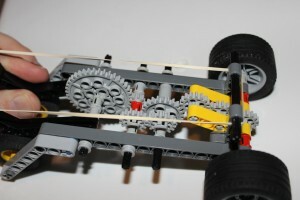 One of the gears in the set that connects to the axle rests freely on one of the gears in the set that connects to the lever. You can see this in the image below. The gear in between the two yellow pieces is resting on the gear to its right. Here are a few more pictures so you can see how the gears are connected. 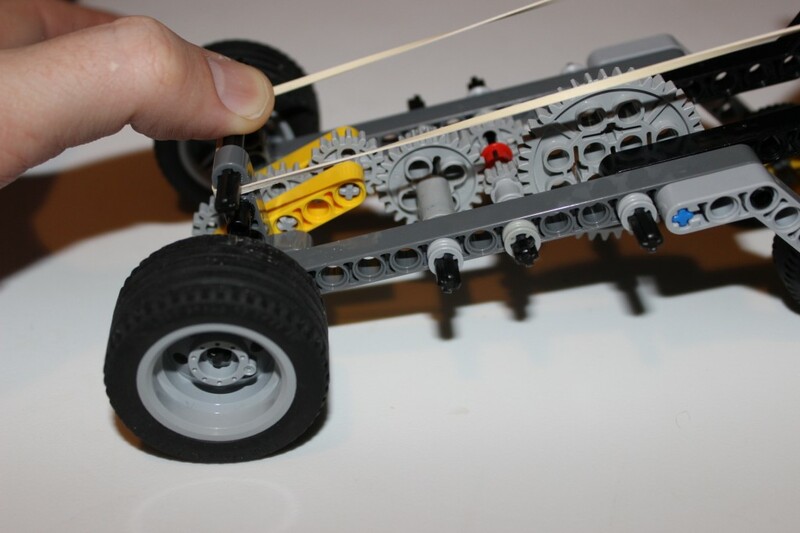 The main downside to this LEGO car is that it’s distance is somewhat limited. Obviously it can be geared up to go fairly far, but it’s limited by only half a turn or so of the gear connected to the lever. With this design, at least, you can’t just wind up the car so that it will go a very long distance. In the video below, you can see that it can at least go ~8-10 feet, maybe more depending on how well it’s coasting. 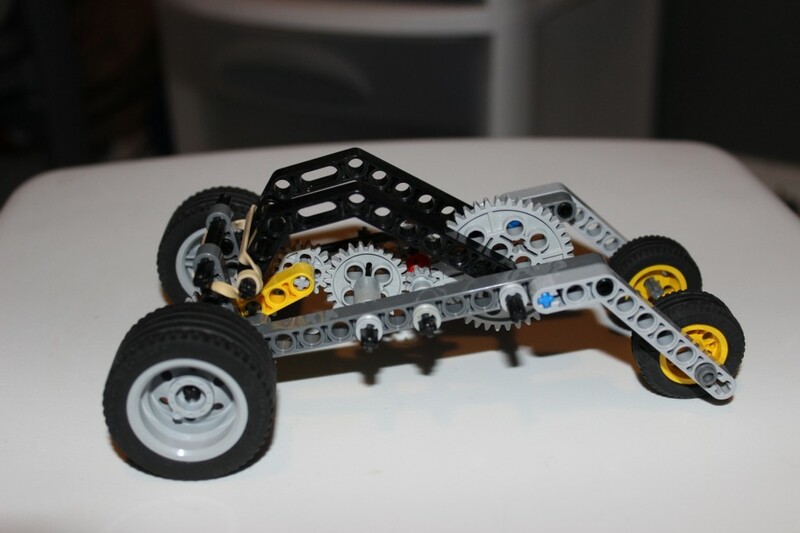 This entry was posted in Cars, Rubber Band, Technic, Vehicles on January 27, 2013 by lego.